What is the Best Way to Improve Public Speaking Skills? 1. Learn To Control Your Voice. As many speaking experts have argued, your voice is a very important tool that you use during the act of public speaking. In order to improve the quality of your voice, practice your diaphragmatic breathing. (This means that you will be breathing from the diaphragm rather than the chest.) When you breathe this way, you will reduce feelings of breathlessness that are induced by speech anxiety. Additionally, diaphragmatic breathing facilitates better control over your tone, volume, and pitch. 2. Develop Excellent Stage Presence. Although you may think that public speaking is all about how well you can articulate ideas, this is only half the picture. In addition to involving the oral dimension of communication, excellent public speaking also incorporates the development and continual improvement upon one’s stage presence. Although defined broadly, stage presence can be thought of as the disposition and attitude one conveys to the public while speaking. As Arlin Cuncic notes in the article “How to Improve Your Public Speaking Skills,” “Good public speakers appear confident, friendly, enthusiastic and energetic.” Developing great stage presence takes time and practice. Moreover, it can be created and sustained by incorporating a plethora of unique strategies, such as speaking about a topic which you are well-versed and/or passionate about. Developing excellent stage presence can also result from spending time in front of the mirror and eliminating unwanted behaviors such as fidgeting and poor posture. 3. Deliver The Message Well. • Speak slowly and deliberately. • Pause between the enunciation of your ideas. • Vary your volume and pitch to facilitate interest. Oftentimes, individuals involved in the process of public speaking place a great deal of primacy on what they are saying as well as how their body looks. When this happens, they oftentimes forget to observe and analyze the audience’s response. This is an important oversight and it should be avoided at all costs. Making your speech interactive will help keep your audience attentive and alert. There are a plethora of ways you can make your speech interactive, including making eye contact with members of the audience and asking questions periodically. If you are attempting to improve your public speaking skills, you should know that there are useful strategies you can implement to make it happen. 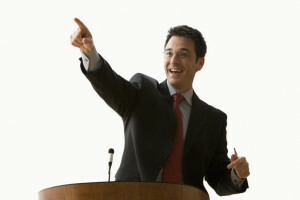 By employing some or all of the techniques outlined above, you will likely find that you gain the knowledge and confidence necessary to excel at public speaking.